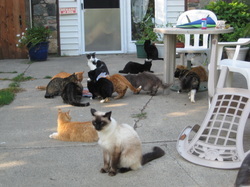 Caring About The Strays, Inc.
At CATS, Inc. we believe that all life is valuable. We try to help many kittens, cats, dogs, and any other animal who comes our way. We know we can't save them all, but we do give comfort and love to the ones we save. Our philosophy is like the Starfish Story: A man was walking along the beach and he saw so many stranded starfish so one by one he put them back in the water. Someone came by and said to him, "What you are doing doesn't matter. You can't save them all." The man replied, "It matters to this one!" Yes, we know that each life we save matters and that is what we do. We help them one by one. In the United States, we euthanize 575 cats every hour!! Too many!! We are trying to change that one by one. With your help and the help of so many wonderful new no-kill shelters, we are trying to change that! !